Elephants upclose: Learning to ride your own elephant individually and in a calm way. To experience elephants in Asia means to get close to the animals and to get a lasting impression of what it means to be on tour with the pachyderms. 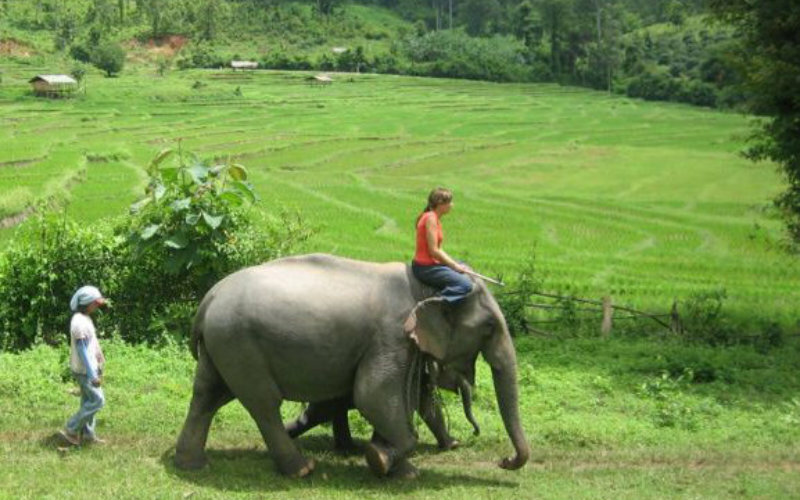 The 3-day elephant tour is an excellent way to get a wonderful insight into the adventure of elephant riding. 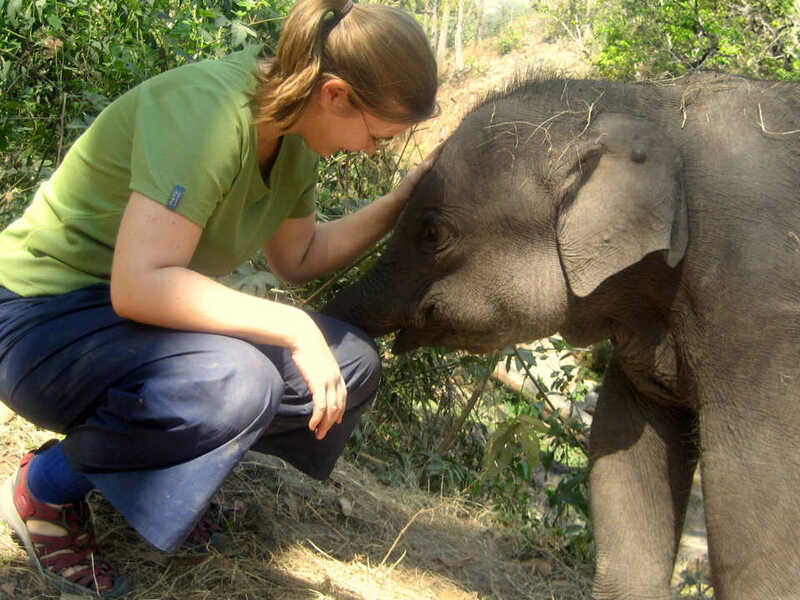 On all booked days, you will go to our elephant camp and spend a lot of time with the animals. You will learn the most important commands to guide your own elephant and enjoy nature in the mountains. We also introduce you to the traditional management of elephant keeping in the timber industry. The Elephants up-close Tour always starts on Mondays and Thursdays. You will be picked up in Chiang Mai no later than 8.30 am. Please always ask for availability before booking! With calm, prudence and as close as you can get to an elephant, we guide you to getting to know these majestic giants. 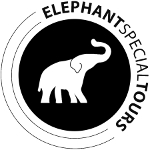 Regarding the discussion “riding an elephant: yes or no” we have created a seperate website, on which we explain the position of ELEPHANT SPECIAL TOURS. Please click here for further information. WHY IS THE 2-DAY TOUR THE SHORTEST TRIP WE OFFER? Being with elephants is something unique most people never forget. We are truly convinced that introducing elephants to people takes time. If you rush at walking with them, bathing them, touching them you misunderstand the natural behaviour of these calm giants. Also information is a key element in getting to know elephants. Asian elephants and asian culture are deeply connected – a bound that should be explained and also should be regarded in today’s fast changing society. All of this takes time – time we are happy to spend with you. No mass tourism: Often a lower price means you will be part of a bigger group. With Elephant Special Tours you will be introduced to each elephant individually. Everyone of them has its own story – a story we take time to tell you. Also bathing in a big group can be stressful for elephants when there are a lot of people running and jumping around. Natural nutrition: We are deeply convinced that a whole nutrition is a key element to the well-being of these magnificent animals. 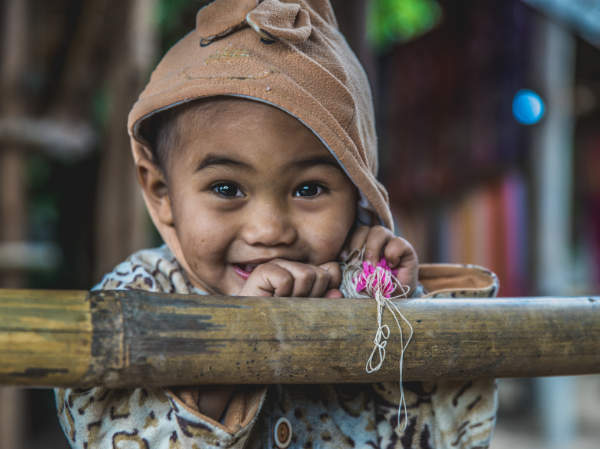 Therefore we guarantee them a variety of food (elephant gras, corn plants, hey, banana trees, rice and many other food offerings) that regard their natural needs. This is expensive since elephants eat up to 400 pounds a day. Also many different paths through the woods are rented where they can find their own food in the wilderness. Cultural bound: Our tours are presented by European elephant experts in english and german. Together with our local staff we can create a source of information that presents insights into Northern Thai culture from a perspective most foreigners regard highly. For legal reasons these European experts create higher costs, a price we are happy to pay. 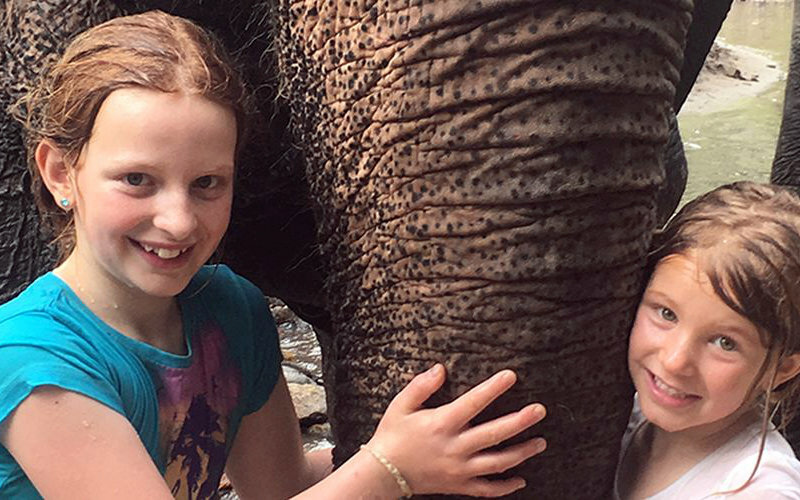 Experience included: Apart from getting to know our elephants you can expect included standard accommodation, full board with great local food, transfer starting at your hotel in Chiang Mai and a landscape that might keep you astonished. We will pick you up from your hotel in Chiang Mai. Pick-ups from the train station are unfortunately not possible, due to the tardiness of Thai trains. You arrive in the village Mae Sapok, where you can leave your belongings in your accommodation for the duration of your stay. During a cup of coffee or tea, we present today’s schedule. We then take a short ride to our elephant camp, which is located nearby. Here information about elephants in general and about the tradition of keeping elephants in Asia is presented. Getting close to our animals, we introduce you to the characters and the story of each individual elephant in order to give you an idea of our beloved project. You then get to know your “own” elephant for the duration of your stay and will cautiously be introduced intensely to your animal. You will then take a seat on the nape of your elephant and learn the first commands to ride the animals. 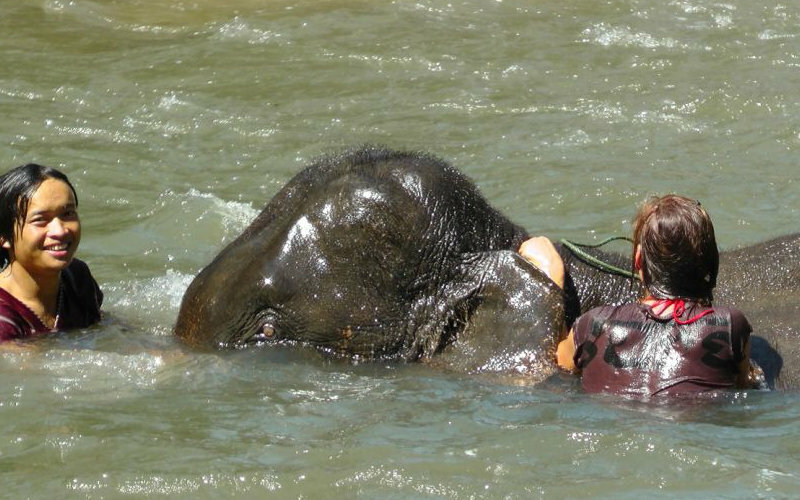 After lunch you lead your elephant to the nearby river and enjoy a long bath with the animals. 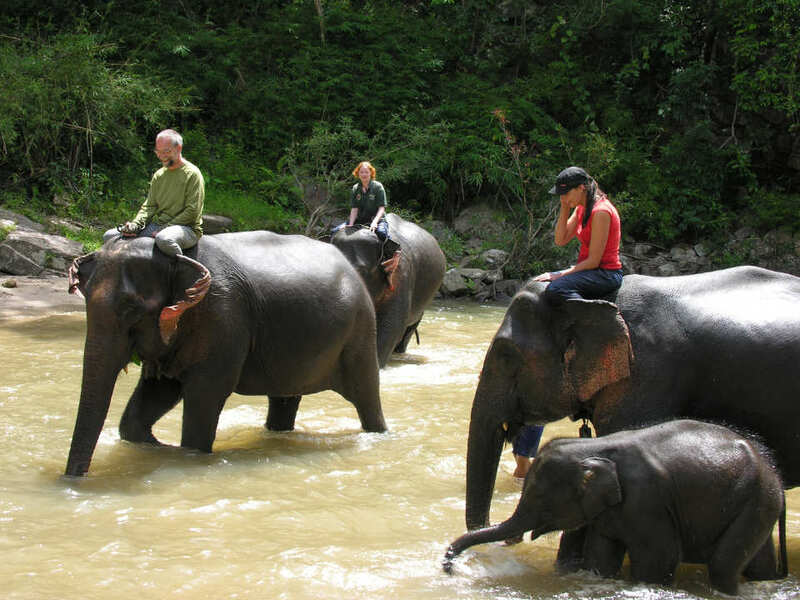 You will then begin an extensive ride through the surrounding woods and finally arrive at the elephant camp again. 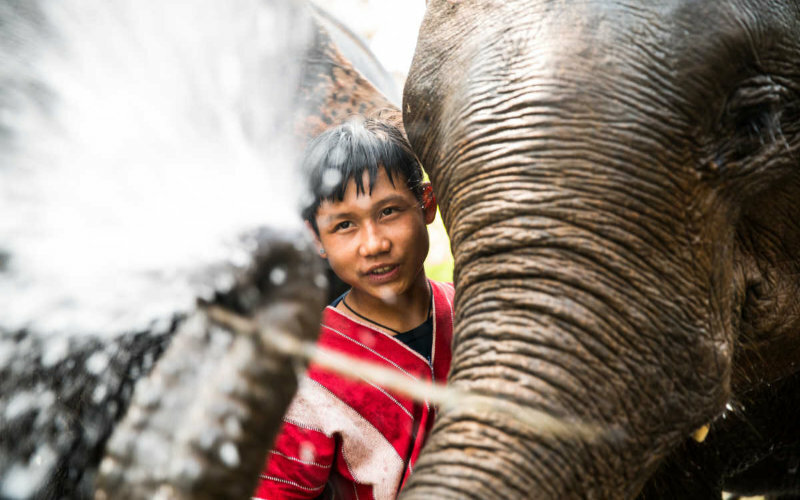 While the elephants now enjoy their free time, you will get to see the village of Mae Sapok. Most residents here belong to the mountain people of the Karen. We introduce you to their lifestyle and also explain how they adapt to the challenges of the 21st century. 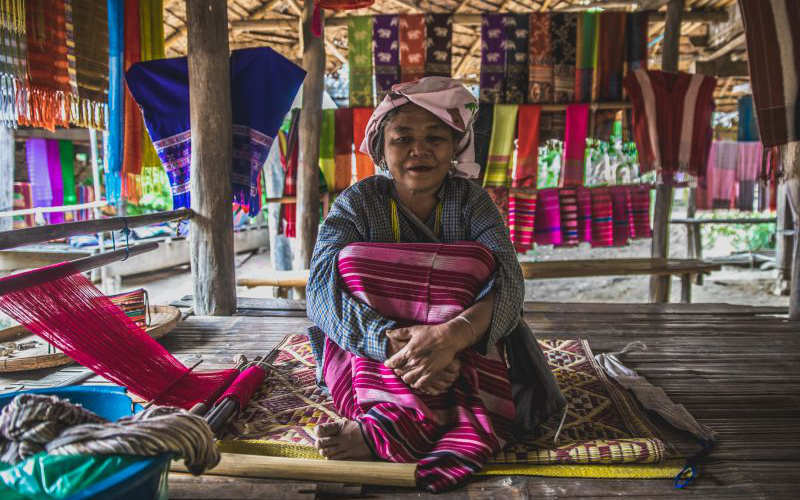 This is not a so-called show-village, in which people are presented for the amusement of tourists – Mae Sapok is a normal village as there are many in the area. After a relaxing shower in your room you can enjoy the multi-course dinner in the dining area of your accommodation. You will then have the opportunity to attend a screening of a video film about elephants. After breakfast you will go to the elephant camp accompanied by your trainer. From there you take a walk into the surrounding forest, where you pick up the elephants from their night time sleeping areas. You’ll ride the animals back to the camp and will be getting more and more confident due to the experience you gained on the previous day in dealing with the pachyderms. At the camp you will have lunch and watch the elephants during their relaxed lunch time. You are then introduced in the specifics of working with the animals, which were trained as so-called Timber elephants. This tradition of work in the timber industry for centuries has been the sole source of income for the owners of the animals – we want to keep these skills and also want you to experience how smart those creatures are. Of course, this training is adjusted without great physical effort to meet your needs. After you have been introduced into the woodwork, we ride another very beautiful way through the nearby forest. Afterwards you visit a local, state development project. It is designed to build sustainable structures for the community, as we are contributed to build a sustainable future for elephants. There is also the opportunity to visit a beautiful waterfall. After your dinner you can watch another video film about elephants. On your last day with the elephants you are already used to your own special friend and easily handle her or him with care. You will take yet another beautiful ride through the woods and are confident on your expertises in showing what you learned so far. After this, it is time to say “Goodbye” and head on to our our partner foundation “Tong Bai”, which cares for the secure future of old and young elephants. After this, you will be transferred to our lodge “White House” where you will enjoy your lunch with a wonderful view. After lunch, you have the opportunity to design a unique piece of remembrance of this trip. A T-Shirt provided by us will be printed with the footprint of “your” elephant. We also introduce you to the unique method of producing paper out of elephant dung. This completes the impressive elephant experience in a pleasant and relaxed way. Prior to departure you can shower before heading back to Chiang Mai, where you can reminisce with hopefully great impressions of your experience. You will arrive in the city at around 5:30 pm.